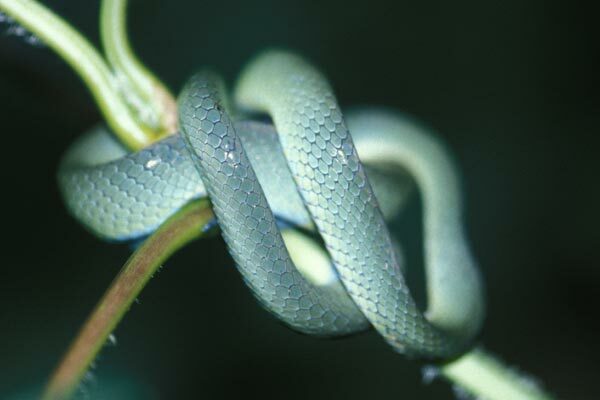 Bwindi is the home of at least four species of small green arboreal snakes. I identified this snake as D. unicolor because that is the only nocturnal green arboreal snake in Bwindi, and this one was napping in mid-afternoon. This snake was moving in the brush along the same trail as the napping one pictured above. The crossbands around the neck and body don't match any of the ones Dr. Robert Drewes collected in his Bwindi herp studies. I asked him if he had any ideas about it and he was kind enough to reply that it was possibly a juvenile Dipsadoboa unicolor. 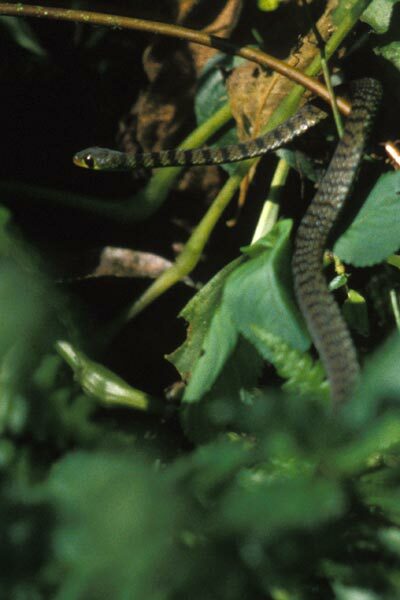 Though he personally hadn't seen any banded ones, Pitman's classic Snakes of Uganda reported that the juveniles were sometimes cross-barred. Since Dr. Drewes is probably the world's leading authority on herps of this area, his guess is the closest I'm likely to get in ever identifying this snake.